Tax fraud, bribery and racketeering still does not guarantee that white criminals will serve time in prison. white privilege is not among the parents now working with prosecutors after allegedly spending half a million dollars to guarantee her daughters’ admission to USC. But experts say Monday’s plea deals are putting legal pressure on Loughlin and other parents who’ve yet to cooperate. As part of her plea deal, prosecutors are advising a prison term at the “low end” of the sentencing guidelines of four to 10 months. She has also agreed to pay a $20,000 fine. The 13 parents pleading guilty are accused of cheating or using bribes to help guarantee their children’s admission into college including Stanford, which has confirmed it expelled a student whose application was linked to the scandal. “What we don’t know is what the government is going to do about some of the students because some of the students knew exactly what their parents were doing,” Klieman said. 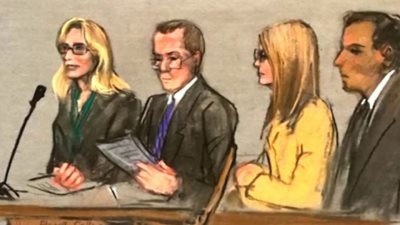 Among the parents agreeing to plead guilty are real estate developer Bruce Isackson and his wife Davina who admitted paying more than a quarter million dollars in Facebook stock to bribe a soccer coach to get their daughter, Lauren, into UCLA. All of the defendants will have to return to Boston to enter formal guilty pleas. A source with knowledge of the probe says there are dozens of other parents under investigation in California alone whose names have not yet been made public.